Nowadays, more jobs are requiring formal training as pre-qualification requisite to meet the standards of prospective employers. Developing the skills through formal training provides significant benefits to trainees including the increase of employment opportunities. The Iyashi no Chikara (Power of Therapy) Project of ACTION (A Child’s Trust is Ours To Nurture), skills training program was implemented to equip individuals belonging to impoverished families with massage therapy skills to help expand their income opportunities, so that with increased income, these individuals may be able to uplift their living conditions. The free massage training offers Swedish and Shiatzu courses for a period of 3 months. On February 9, 2017, eight (8) trainees (2 males and 6 females) have satisfactorily completed the training and celebrated the 2nd Batch of Graduation Ceremony held at the ACTION’s Chikara Project Studio in Quezon City. 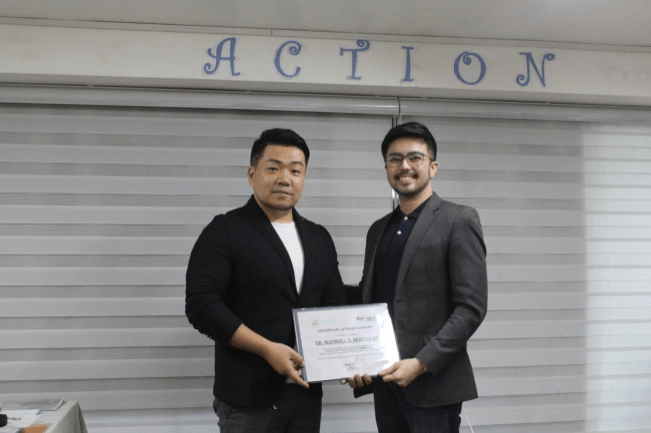 This event was attended by prominent entrepreneurs in the field of Beauty and Wellness in the Philippines and in Japan; namely Dr. Nol Montalbo, the CEO of Mont Albo Wellness Corporation and one of the successful young entrepreneurs in the Philippines, six (6) Board of Trustees of the Association of Japan Relaxation Industry (AJRI) and Chief Executive Officer (CEO) of a well-known salon and spa in Japan attended the event. They were Mr. Shimizu, CEO of Bodyworks; Mr. Susuki, CEO of A-one; Mr. Tomioka , CEO of Bellepok; Mr. Eguchi, CEO of Medirom; Ms. Rin, CEO of Clair; Ms. Yoshioka, Board Member of Medirom. Furthermore, The Department of Social Welfare and Development-National Capital Region (DSWD-NCR) also showed support by sending representatives namely Mr. Allan Sanchez, Ms. April Co, Mr. Ephrain Domingo, Ms. Sally Consular, Ms. Maydi Alindogan and Ms. Jessa Christie Atim, respectively. Mr. Yokota, Founder/ Executive Director of ACTION, Inc. gave a warm welcome to all the graduates, partners and guests. He showed a short presentation of the ACTION’s Programs and Services being provided to the communities and partner residential facilities. The CHIKARA Project is funded by SaKuRa Project by REJOB in Japan, and on behalf, Ms. Miho Ueda, the Project Manager, shared the REJOB vision for the year 2020. She said that being a therapist will give the graduates a bigger chance to have work and ability to heal many people. 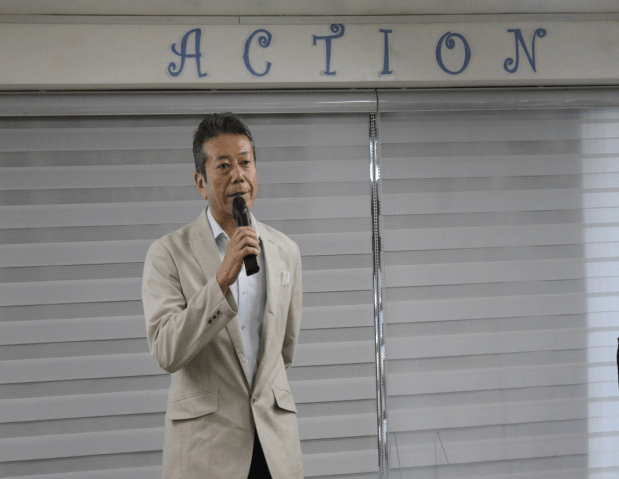 In addition, Mr. Hidefumi Shimizu, Chairman of Association of Japan Relaxation Industry and CEO of Bodyworks also shared his experiences on how to become a successful professional therapist. “Sometimes, our success is not about the degree/courses we finished but hard work. By just taking small steps, one day you will get there, as a multi-millionaire.”, an inspiring message shared by Dr. Nol Montalbo. Like any ordinary people, he also experienced financial difficulty until one day he decided to pawn his watch worth Php 1, 500.00 and from that small capital, he started to make beauty soaps that he used to sell online and even sold in the streets from their hometown in Batangas to Manila. Through that small time soap business, he was able to put up his very first Massage Spa known as the Mont Albo Massage Hut in Makati City. Because of his hard work and perseverance, his very own business has now grown to fifty-eight (58) branches all over the Philippines. One of the massage services in Mont Albo is called “HILOT” or the Filipino Traditional Massage. He said that as Filipino we should never forget our own brand of massage therapy because it is our identity. Eight (8) graduates of Massage Training from Olongapo City together with their Instructor, Mr. Rudy Espirito were also present to give support and to be imparted with the knowledge and inspiration of all the guests present. 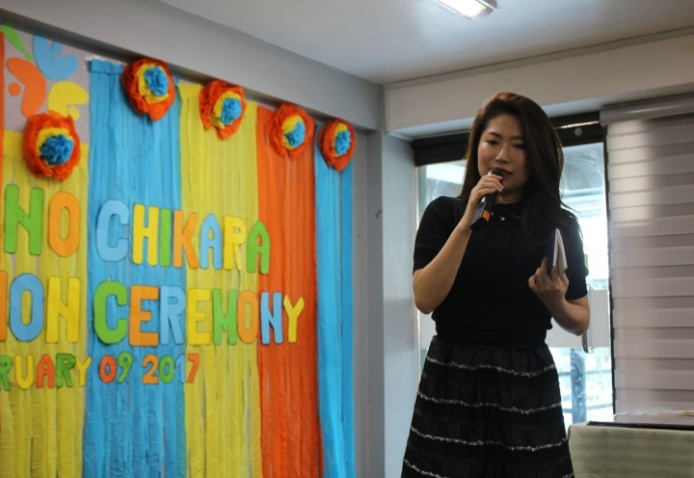 Ms. Nancy A. Campos, one of the graduates, shared her story why she was encouraged to be trained in the Iyashi no Chikara of ACTION. For her, in learning age doesn’t matter. Though she is now Fifty Three (53) years old, she is still willing to discover more of her abilities and learn new skills. She really works hard for her family. 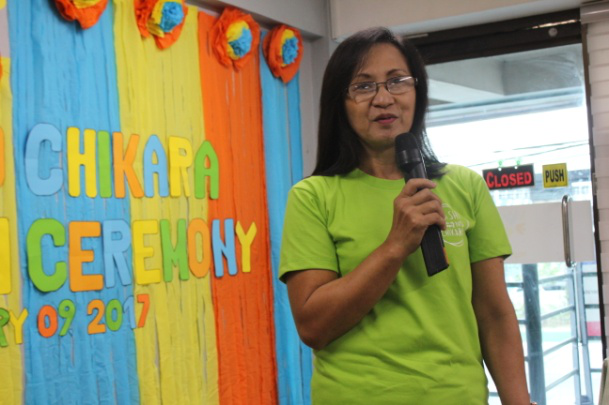 Aside from the grants she is receiving from DSWD through 4Ps (Pantawid Pamilyang Pilipino Program); the skills that she acquired from the training will also help her to augment income for her family. Thus, she is very grateful to ACTION and REJOB for giving her this one of a kind opportunity. One of the major partners in the implementation of the project was the Department of Social Welfare and Development-National Capital Region (DSWD-NCR). 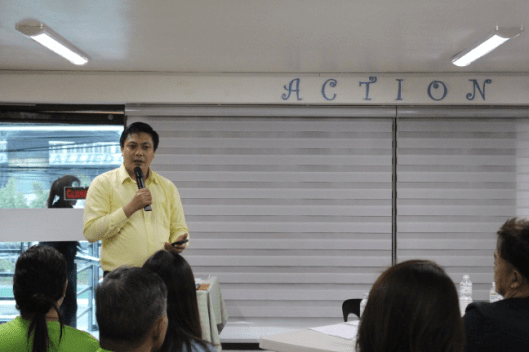 Mr. Allan Sanchez, a Pantawid Pamilyang Pilipino Program (4Ps) Area Coordinator in Quezon City gave an inspirational message to the graduates. He also expressed his appreciation to ACTION for the continuous support being provided to their beneficiaries. Iyashi no Chikara Massage Training in Quezon City still aims to train more massage therapists coming from underprivileged families in Metro Manila. Registration of applicants for the 3rd Batch of Massage Training is now open and the schedule of the training is soon to be announced. Contact ACTION at 02-376-9498 or 0946-136-5512for more information.